The annual L. Ron Hubbard Birthday Celebration at the Church’s Flag spiritual headquarters in Clearwater, Florida, was crowned Saturday evening by a stirring event observing the Founder’s 104th birthday. In testament to Mr. Hubbard’s triumphant and eternal technological splendor, the anniversary of his birth (March 13) was marked with a raucous observance attended by a capacity crowd and presided over by Mr. David Miscavige, Chairman of the Board Religious Technology Center and the religion’s ecclesiastical leader. 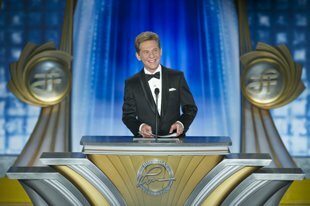 Mr. Miscavige cited numerous milestones and honors that L. Ron Hubbard and his indelible works have generated over the past 12 months, headed by an enormous tribute from the Smithsonian Institution last November in naming the Scientology Founder one of the 100 Most Significant Americans of All Time. In all, he has now received more than 5,000 individual recognitions worldwide. No LRH Birthday event would be complete without a spirited and inspiring biographical presentation honoring the man of the hour in his own words, featuring captivating tales from a dashing life spent crisscrossing the globe and accruing wisdom. The esteemed longtime LRH Biographer, Mr. Dan Sherman, presented stories of the Founder’s adventures from the Alaskan Panhandle to the shores of Japan to the wilderness of a place called New York City. To those who practice Scientology, the religion’s Source and Founder L. Ron Hubbard remains far more than merely symbolic. His teachings and technology are a pervasive, indelible, ubiquitous and enduring legacy. So it is that thousands of Scientologists gathered to spotlight that towering tradition on Saturday evening, March 14. One of the night’s most hotly-anticipated elements honored the champions who play what has come to be known as The Birthday Game, spotlighting the Churches and Missions of Scientology that generated the greatest expansion over the past 12 months. This year’s Birthday Game world champions hailed from three continents. Mr. Miscavige also presented a special award to honor a Scientology Organization (Org) in a league of its own. The Model Ideal Organization of Los Angeles’ speed of expansion was so profound it reached the size of Old Saint Hill two times over and thus was awarded the singular status of Model Ideal Saint Hill Size Org. The event climaxed with a presentation of Scientology’s epic expansion during the past year and looking to the future, including the planned opening of new Ideal Orgs in North America, South America, Asia, Africa and Europe as well as the Scientology Media Productions global communications center in Hollywood, California. The crowning achievement of future Church expansion was unveiled by Mr. Miscavige with the announcement of the future L. Ron Hubbard Hall in Clearwater, Florida. The L. Ron Hubbard Park will stand at the gateway to the city and present a striking entrance to the new LRH Hall. Monuments depicting the 21 precepts of the Founder’s non-religious moral code The Way to Happiness will pay homage to his work, and so reflect his path to a happier world. Upon entering, visitors will be greeted with a grand lobby rising two stories and lined with words from L. Ron Hubbard cut into the very structure. The auditorium is designed to seat thousands with every element selected to enhance the quality of communication. From materials providing the greatest acoustics, to the classic design of the seating for optimum views. The auditorium is further designed to seamlessly transform from a grand theater to an exquisite convention center, creating the ideal setting for community outreach events, international conventions and gala celebrations. The L. Ron Hubbard Hall is the future home of international Scientology events, conventions and celebrations. The facility is set to stand directly adjacent to the Church’s spiritual headquarters—the Flag Building. To those who practice Scientology, the religion’s Source and Founder L. Ron Hubbard (LRH to Scientologists) is far more than merely symbolic. His teachings and technology are a pervasive, indelible, ubiquitous and enduring legacy whose significance continues to grow and evolve with each passing tick of the calendar. Mr. Hubbard’s towering spirit lives on in those around the globe who follow the profound, prescient example for living and personal enlightenment that he set into motion—and extends forevermore to the countless others his life has touched. The sheer greatness embodied in Mr. Hubbard’s words and deeds were honored Saturday night to mark the annual LRH Birthday Celebration at the Church’s Flag spiritual headquarters in Clearwater, Florida, on the occasion of the Founder’s 104th birthday. In testament to Mr. Hubbard’s triumphant and eternal technological splendor, the anniversary of his birth (March 13) was marked with a raucous observance attended by a capacity crowd and presided over by Mr. David Miscavige, Chairman of the Board, Religious Technology Center and the religion’s ecclesiastical leader. He opened the proceedings by placing the eternal power of LRH’s creation into a palpable context. Mr. Miscavige raised numerous milestones and honors that Mr. Hubbard and his indelible works have generated over the past 12 months, headed by an enormous tribute from the Smithsonian Institution last November in naming the Scientology Founder one of the 100 Most Significant Americans of All Time. In all, he has now received more than 5,000 individual recognitions worldwide. The event climaxed with a presentation of Scientology’s epic expansion during the past year as well as the future, including the planned opening of new Ideal Orgs in North America, South America, Asia, Africa and Europe as well as the Scientology Media Productions global communications center in Hollywood, California. There was also the momentous announcement of the future L. Ron Hubbard Hall in Clearwater, a magnificent auditorium designed to seat thousands with convention and banquet conversion capability, complemented by a beautifully-appointed L. Ron Hubbard Park. The sleek digital design concept for the project presented to the gathered birthday crowd a facility set to span a full city block in Downtown Clearwater. One of the night’s most hotly-anticipated elements honored the champions who play what has come to be known as The Birthday Game, citing the Churches and Missions of Scientology that generated the greatest expansion over the past 12 months. As the story goes, the game was born long ago when Mr. Hubbard was asked what he wanted for his birthday and he quipped in reply to five times expansion. It was that expansion that became the game’s catchphrase and has continued annually since. This year’s Birthday Game world champions hailed from three continents and boasted newly inaugurated Ideal quarters in every category: the Ideal Mission of Belleair, Florida; the Ideal Organization of Sydney, Australia; the Ideal Advanced Organization of Los Angeles; and the Ideal Continental Liaison Office of Europe in Copenhagen, Denmark. Mr. Miscavige also presented a special award to honor a Scientology Organization (Org) in a league of its own. The Model Ideal Organization of Los Angeles’ speed of expansion was so profound they reached the size of Old Saint Hill—the Organization that Mr. Hubbard himself headed in East Grinstead, Sussex. In fact they obtained these heights two times over. In so doing Los Angeles, not only became a model for every other org to emulate but a standard-bearer for a Golden Age of Administration and thus was awarded the singular status of Model Ideal Saint Hill Size Org. And no LRH Birthday event would be complete without a spirited and inspiring biographical presentation honoring the man of the hour in his own words, featuring captivating tales from a dashing life spent crisscrossing the globe and accruing wisdom. This year’s adventures included stories from the Alaskan Panhandle to the shores of Japan to the wilderness of a place called New York City.